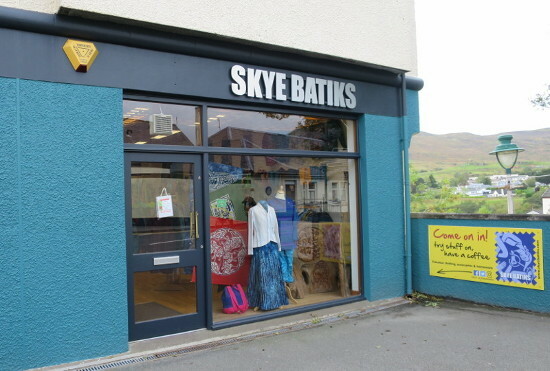 Skye Batiks began colouring the world, on the Isle of Skye, in 1987. Spectacular batik clothing, outrageous accessories, sensational handloom smocks and stylish homeware. Being different sometimes means being bold. We have abandoned the traditional online shop to bring you the award winning personal service we enjoy providing in the shop, through social media. We believe the dynamic nature of social media is better suited to Skye Batiks and that our unique creations can be better showcased via new, frequent posts. If, for whatever reason, you don’t do social media, we are only a phone call away and can email you pictures of any current stock you are interested in. Significantly different clothing in fabulous contemporary and Celtic designs. Our batik clothing range includes; shirts, skirts, trousers, patch items, kurthas, scarves, lady’s tops, aprons, kaftans, fleecy hooded tops and an everchanging range of new items inspired by our regulars. All our batiks are hand made in the Skye Batiks workshop in Sri Lanka. Let others live in the background. Make a statement and put a bit of fun in your life with Skye Batiks. Whilst we admire modesty, we do feel that nobody does bags like we do. Made in vibrant batik and fabulous hand-loomed cotton – all are beautiful. Be prepared for strangers to come up to you and ask where you got ‘that’ bag. Big Tiggy, Tiny Tiggy, Flappy, Shopper, Doofy, Sriyani, Rucksack, Neck Bag, Therssy, Zippy, Chirpy – which bag type are you? Our famous handloom smocks are made on the Isle of Skye from luxurious, long-lasting, hand-woven cotton. Available in ‘traditional fisherman’s’ Open and Cowl neck styles, plus the ever-popular ‘front-loader’ Zipped Jacket. The Hoodie completes the stylish line-up. Be careful which colour you choose because it is going to be your friend for 20+ years. From subtle to ‘knock-out’ vibrant, smocks will be noticed. They will quickly become a way of life. Make your home environment something special with Skye Batiks. Choose from; Celtic wall-hangings, cushion covers, tablecloths, table-runners and bathmats. We post frequent pictures of new and exclusive items on Facebook, Instragram and Twitter. These items will be available for that day only. If you need to add to your collection, contact us via social media, email (info@skyebatiks.com) or call the shop on 44/0 1478 613331. Once they are gone, that is it until the following post. If you want the next post to be of any specific category, please let us know. If you are anywhere in the northern hemisphere, call in for a coffee and a look around. We are in Portree (IV51 9BY), the recognised centre of the known world.